Arlington Place – It’s Blue Crab Season! LocationHomeGeneralArlington Place – It’s Blue Crab Season! It’s that “Blue Crab” time of year here at Arlington Place. 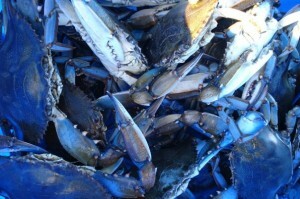 In fact, right now the bottom of the river is crawling with big, blue crabs. My husband Blair caught four dozen crabs last night—without any bait! They are really huge this year; we call the big guys “#1 Jimmy Blues” around here. They’re also more than a little feisty, but full of meat and oh, so delicious. Summer evenings with crabs and beer on the back porch at Arlington Place…does it get any better?